Bolt is drowning سے طرف کی heavy ball. (upgraded). Hi fanpop. this is an upgrade of the earlier "Bolt is drowning سے طرف کی heavy ball." i hope my freind theJF, will like the upgrades...(even the shadows. )...so i can see if im gonna make another upgrade. enjoy my friends! ;D. HD Wallpaper and background images in the Disney's Bolt club tagged: bolt heavy ball sinking drowning..
لفظ مطلوبہ: bolt, heavy ball, sinking, drowning. This Disney's Bolt fan art might contain ڈاؤن لوڈ ہونے والے, مزاحیہ کتاب, منگا, کارٹون, ہالی ووڈ, and کامک بُک. Thanks dude. It only took 2 nights, before it was finish. And there will be a "part 2" of this. It is about vViolet draging Bolt to the surface. 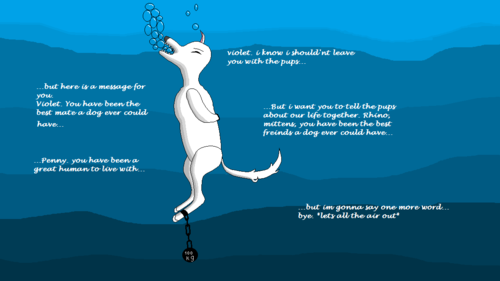 And part 3...(that also is the last one)...is about Violet giving Bolt cpr. Im actully nearly finish with part 2. I'll just make Violet's front legs/arms, and the shadows. Interesting. Will be patiently await your new submissions! And now I have agreed with myself that I'd like to do an article version of this fan art. but I've thought about it. I would like to have your allowed on some things I was unsure about. but I would like to say that some of the things I mention in a moment, might sound a bit overrated. but before I do that I will be you to do as it says underneath. Set a plus out of ideas you like. Set a minus out of ideas you do not like. 1) Penny is 18 - 21 years old. 2) Penny is one that can be called a "science geek." 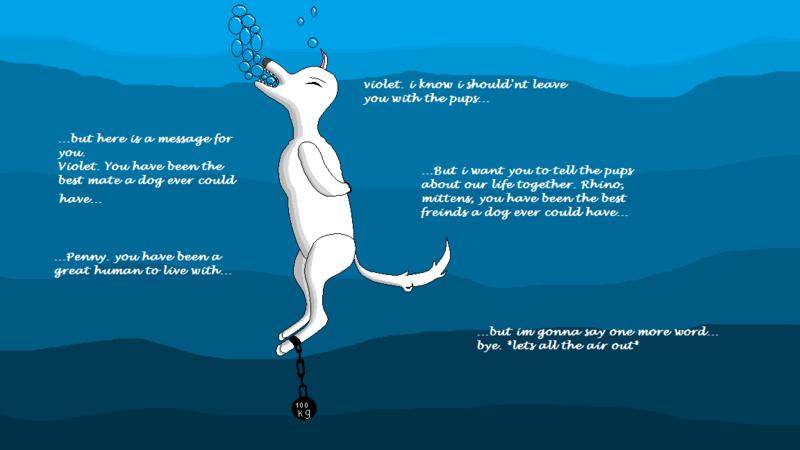 3) Bolt and Violet is still alive, after all these years. 4) Calico ... (Well is a villain in "movie" so ...) ... is a villain in the real world. 5) Penny also has a house with a laboratory in the basement. 6) Penny also has an armory. I'll try to be back on here soon to read your reply when I can. oh and it might take a while. (1-4 weeks) because i have three problems. 1) im not the greatest artist. 2) my PC is filled up EVERYWHERE with commercials. 3) my computer game still needs more stuff. but i will take a break from it.